A unique venue directly overlooking the sea and harbour.. 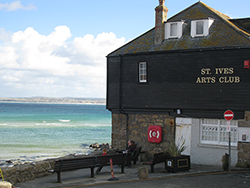 Housed in a beautiful old wooden building - founded in 1890 by members of the St Ives artists colony. There is a gallery space downstairs and a theatre upstairs hosting events for both members and visitors. Most weeks at the club - solo or group shows - all open to the public - free entry - work for sale. Live Music - Theatre - Poetry - Comedy - Cabaret. The club regularly hosts entertainment in the upstairs theatre - a unique intimate atmosphere with audiences limited to 40 - 60 people. You can bring your own drinks. Events every day and evening throughout the festival fortnight - including arts talks, workshops, films and theatre.